Good Afternoon Everyone, well the last two days have been quite busy so I fell behind on SCS challenges. So today when I saw the inspiration challenge IC179 to go to Bonjour Mon Coussin website and pick out a pillow...ooo I noticed there was a pillow that had Kraft, I really liked the the way it was striped with two colors.. So this card is also for the Ways to use it challenge WT217 to use kraft. Friday's challenge LSC219 was way too fun couldn't pass it up. It was to make a card for a May holiday. Well National Pet Week is in May so thats when I decided to use this image!!! 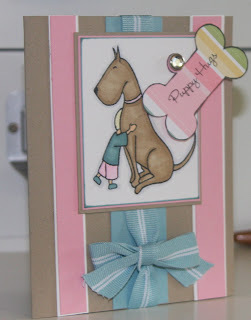 Hope you like my card today, I really had fun using this cute image and the dog collar... I really like the black outline on the collar it just added a little more!!! Have a great day everyone!!! Thanks for stopping by my blog today! What a cute card, Crystal. Love the colors and the sweet image.. Such pretty colors! And that image always touches my heart!Great job! This is absolutely adorable. I just love those stripes and that bone (tag) is fabulous!